Fluted Bowl. 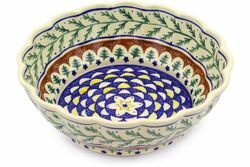 This Polish Pottery Salad bowl is ideal for serving your salads or chips. This bowl is beautifully decorated both inside and out and makes a stunning centerpiece. Each stoneware bowl is a unique creation by talented artisans from Poland. No matter what the occasion, quality handmade pottery is a gift that's sure to be treasured for years to come.